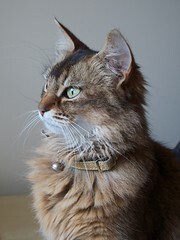 Regular readers will know that we recently lost our much-loved rescue cat, Cleo. We were really devastated by losing her, and felt completely bereft without her. While we'll never be able to replace her, and she'll always be very special to us, we really wanted to get another Somali, because we'd fallen in love with the personality of the breed. So we put our names down on the list for rescued/re-homed Somalis, expecting that it might take several months for a suitable cat (that is, a cat happy to be an indoor cat) to come up. Much to our surprise, we were told almost immediately that there were a couple of cats available for re-homing. We weren't expecting to get a cat so soon, and weren't expecting that we might be able to get two, but it was pretty obvious that we weren't going to be able to resist! Unlike Cleo (who was a stray with a totally unknown and probably unhappy past), these two cats were being re-homed and were extremely well-loved and cared for since birth by a wonderful woman. They are lovely cats -- healthy and fit and very well behaved. Bella (top picture) looks a bit like a lynx, and has incredible large green eyes and is a really sweet-natured, gentle cat and an adventuress. Bianca (bottom picture) has a gorgeous coloured coat (called sorrel silver) which is a cinnamon-copper on top of white. She is very soppy, and loves being stroked and sitting on laps. We only picked them up yesterday, so they are still exploring the house and getting used to their new surroundings, but I think they will settle in well. 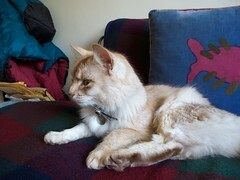 It's wonderful being around cats again, and we're really looking forward to getting to know two new cat personalities. We feel really privileged to be able to look after them. There are a couple more photos of both Bella and Bianca on Flickr, and I'm sure that there will be many more to come!